Tickets will sell out fast. Be sure to reserve your seats soon! Click here to purchase tickets online! You do not need a PayPal account to use this link. This event is open to the public so please spread the word and invite your friends. It will be a wonderful evening Italian style. We'll have Italian wine, cannoli and you'll have many chances to walk away with a valuable gorgeous Italian designer purse. Tables can be reserved in groups of at least 8 (9 or 10 are possible but 8 will fit most comfortably per table). If you would like to reserve a table for your group, please contact Penny at Ppescosolido@gmail.com or 419-293-5277 to let her know the name your table should be reserved under and the names of the other ticket holders to seat with you. 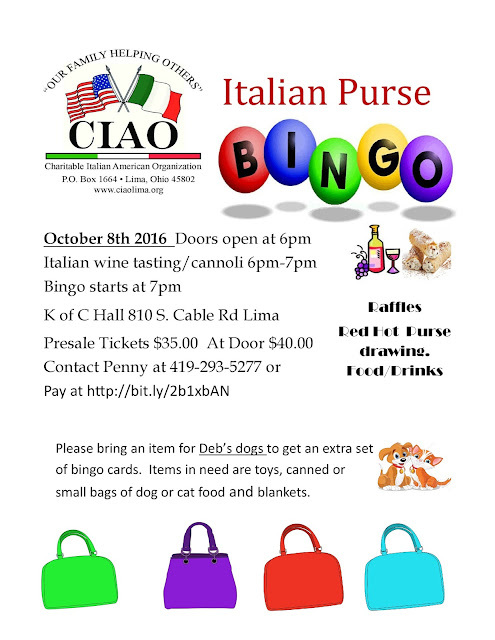 We would prefer all tickets for each reserved table be paid at the same time (via the online payment link posted or by sending a check to our CIAO p.o. box 1664 Lima, Ohio 45802). We will not be able to guarantee a full table reserved for your party until at least 8 tickets for the table have been purchased.